Our robust research methodology has helped us to create another insightful and comprehensive report titled ‘Industrial Refrigeration Equipment Market: Global Industry Analysis 2012 – 2016 and Forecast 2017 – 2026’. In order to infer the market size, historical data, primary responses and public domain data has been thoroughly analyzed. Revenue of companies in the industrial refrigeration equipment market has been benchmarked to ascertain the market size for the base year. Macroeconomic indicators such as GDP and industry growth have been considered to forecast the market size over the forecast period. The historical growth trend of end-use industries, market participants’ performance, as well as the present macro-economic outlook has been taken into consideration for estimating the overall market trend forecast. This data is then validated with the help of the triangulation method and is extensively scrutinized using advanced tools to garner quantitative and qualitative insights into the global industrial refrigeration equipment market. In order to have an ease of understanding and for the better organization of the report, this report on the global industrial refrigeration equipment market is divided into four distinct parts. The first part of the report contains the introduction section that has the executive summary of the report. This part also contains the market taxonomy and the definition of the product along with the market viewpoint. The second part of the report comprises global industrial refrigeration equipment market size and forecast analysis by equipment and application. This part of the report contains important market numbers in the form of revenue comparison, market share comparison and year-on-year growth comparison. The third section of the report features the regional assessment of the global industrial refrigeration equipment market and the regions are chosen as per the market taxonomy. The last part of the report contains the competition landscape of the global industrial refrigeration equipment market and has information on the key players operating in this market. The competition landscape contains detailed information on the important companies in the global industrial refrigeration equipment market in the form of company description, product overview, key developments, strategic overview and key financials of each of the featured companies along with a comprehensive SWOT analysis. This competition landscape is a valuable part of the report as it contains all the necessary information to study the leading companies operating in the global industrial refrigeration equipment market in detail and also reveals how they implement their strategies and vision to stay at the top in this highly competitive market. If you are aiming to enter the global industrial refrigeration equipment market, then this report is a comprehensive guide for you and will give you crystal clear insights about this vast and lucrative market. All the major types of industrial refrigeration equipment are covered in this report and information is also given on the important regions of the world where this market is anticipated to boom in the near future, so that you can plan your strategies accordingly. For new entrants to this market, the voluminous data provided in this report is invaluable. Industrial refrigeration equipment is utilized in various end-use industries such as processing of food and beverages, cold storage applications and chemical processing, where temperature control of the materials is required. Such type of products command a huge demand in food processing, beverage production, process cooling and HVAC applications. The global industrial refrigeration equipment market is fueled by a rising number of applications in the food and beverages industry, pharmaceuticals and chemical industry. The market is also being influenced positively due to the acceptance of natural refrigerants, a rapidly expanding processed food industry and efforts towards attaining energy efficiency in advanced countries. Another important factor driving the growth of this market is the huge demand for the cold storage of various food and beverage products. In the pharmaceutical industry, R&D initiatives pertaining to the manufacturing of new drugs require industrial refrigeration equipment for storing samples. However, rising costs of fuel is expected to restrict revenue growth of the market. Manufacturers of industrial refrigeration equipment are concentrating on designing environment friendly products that have a greater chilling efficiency. Persistence Market Research presents a detailed study of the global industrial refrigeration equipment market in which all the aspects related to this vast market have been studied comprehensively. This report covers all the important regional industrial refrigeration equipment markets that are located in various regions of the world. The report presents a historical analysis of this market for the time period 2012 to 2016. In addition, the projections for the global industrial refrigeration equipment market are given for a time period of nine years, starting from the year 2017 and ending in the year 2026. As per the assessment of Persistence Market Research, the global industrial refrigeration equipment market is slated to exhibit a robust CAGR. 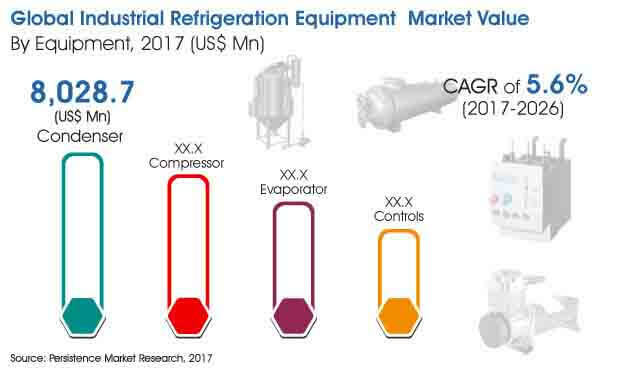 The global industrial refrigeration equipment market was estimated to be valued at nearly US$ 22,650 Mn at the end of the year 2017 and is slated to reach a value of nearly US$ 36,900 Mn by the end of the period of forecast in the year 2026. The condenser sub-segment in the equipment category of the global industrial refrigeration equipment market is estimated to exhibit a robust CAGR of 5.1% during the period of assessment. The condenser sub-segment is the most lucrative by value in the equipment category and was estimated to be valued at nearly US$ 8,050 Mn at the end of the year 2017; this segment is poised to reach a value of nearly US$ 12,600 Mn by 2026. The compressor sub-segment is the second largest in terms of revenue in the equipment category, and is expected to exhibit a CAGR of 6.3% during the period of assessment. The compressor sub-segment in the global industrial refrigeration equipment market was estimated to be valued at nearly US$ 6,750 Mn in 2017 and is poised to reach a market valuation of about US$ 11,700 Mn at the end of the period of assessment in 2026. The competition landscape of the global industrial refrigeration equipment market report features the important companies operating in this market. Some of the top companies that have been included in the report are Johnson Controls Inc., Emerson Electric Co., United Technologies Corporation, Parker Hannifin Corp, Danfoss A/S, Ingersoll-Rand plc, Lennox International Inc., Dover Corporation, GEA Group AG and Daikin Industries, Ltd.